SEOUL, Aug. 1 (Yonhap) -- Three Japanese lawmakers arrived at a South Korean airport on Monday, defying Seoul's repeated warnings that their entry will be banned due to their attempt to reassert Tokyo's claim to the South Korean islets of Dokdo. Yoshitaka Shindo, Domomi Inada and Masahisa Sato, all from Japan's conservative Liberal Democratic Party, arrived at Seoul's Gimpo International Airport as planned, but the South Korean government said it will ban their entry at the immigration check point and send them back on the return leg of the ANA flight they arrived on. 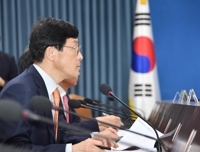 The Japanese legislators announced earlier that they planned to visit the South Korean island of Ulleung, located about 90 kilometers west of Dokdo in the East Sea, during a four-day trip here. The move sparked outrage among some South Korean politicians, who viewed it as another attempt by Japan to lay claim to the set of rocky outcroppings. South Korea dismisses Japan's claims as nonsense, saying it regained control over all of its territory, including Dokdo, at the end of Tokyo's 1910-45 colonial rule.